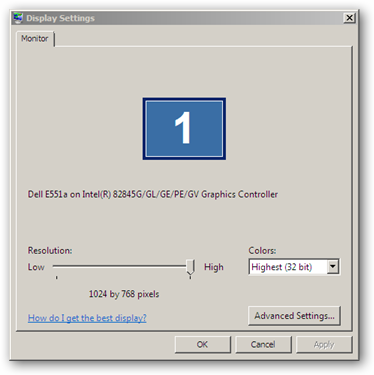 How to install the Intel (R) 82845G/GL/GE/PE/GV Graphics Controller driver on a Microsoft Windows Vista installation. The Intel (R) 82845G/GL/GE/PE/GV Graphics Controller is a competent integrated device capable of a screen resolution of 1280x1040 and offers some bells and whistles. In other words, it can simply do the job under Microsoft Windows XP. 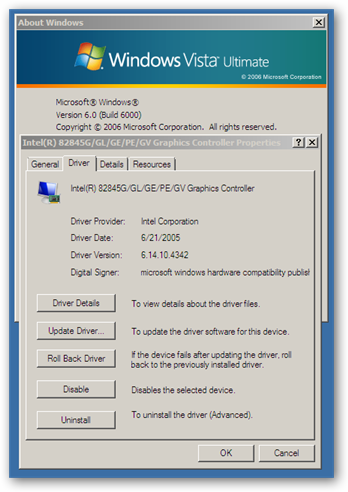 Under Microsoft Windows Vista, however, the Intel (R) 82845G/GL/GE/PE/GV Graphics Controller is not supported by either the operating system nor Intel. After a fresh installation of Microsoft Windows Vista, all drivers on the test box IBM NetVista desktop were fully operational except the Intel (R) 82845G/GL/GE/PE/GV Graphics Controller. 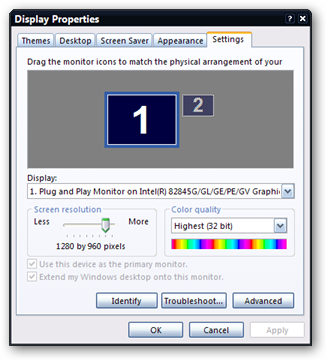 Microsoft Windows Vista used a generic driver with a reduced resolution of 640x480. After a couple of hours of research and a few unsuccessful tests, the answer is unbelievably simple.Install the driver manually. I chose a Microsoft Windows XP driver from Intel. To install the driver manually: Right click on My Computer -> select Manage -> Device Manager -> Display Adapters -> select the device -> select the Driver tab -> choose Update Driver -> select Browse my computer for driver software -> chose the location of your drivers and install the driver. A reboot is required. The result, Microsoft Windows Vista with the Intel (R) 82845G/GL/GE/PE/GV Graphics Controller driver for Microsoft Windows XP with a maximum screen resolution of 1024x768. Even with the reduced functionality, the computer is at least functional. Note: The use of the Microsoft Windows XP drivers for Windows Vista is more global than the graphics controller. The manual installation of drivers may be the solution to other drivers not supported by Windows Vista.